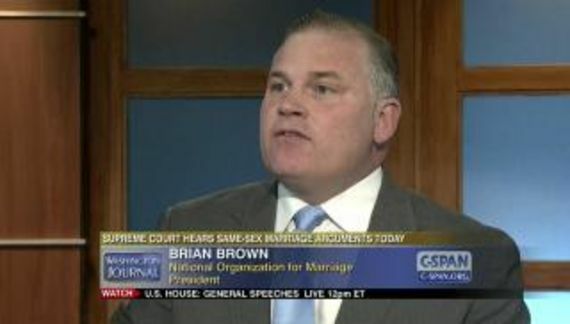 At some point we might actually have to thank Brian Brown for advancing the cause of marriage equality. The fundamentalist Catholic head of National Organization for Marriage has once again decided to seek revenge against a Republican congressman who is a proponent of marriage equality. Brown's target this time is upstate New York congressman Richard Hanna. Hanna's offense is that he has reportedly signed an amicus brief in support of striking down California's Proposition 8. According to Brown, Representative Hanna "will get a primary opponent." Hanna is a moderate Republican representing a Democratic district. Brown never has quite understood New York demographics. If Brown does find a candidate (which I doubt) and should that individual defeat Manna in the primary, they are probably going to cede the seat to a Democrat. upstate New York congressman Richard Hanna.